During this season of Thanksgiving, we have much to be grateful for—rain that has replenished our groundwater reserves, farmers who continue to work tirelessly to grow good food, and a community that supports local food grown with care. We are filled with hope each week when we see parents bringing their kids to the market to introduce them to fresh, delicious, seasonal produce and to show them how shopping for food can be fun! We are also grateful to the many vendors and farmers that are bringing their children and young teenagers to the market to continue a family tradition of farming and food-making that is harder to do in the face of a corporate world of food-like, fake food choices that accost our senses every day. It is harder to do, and takes stamina and grit, and it is the right thing to do, and we are grateful. Suzanne Santos, Farm Direct Program Director. 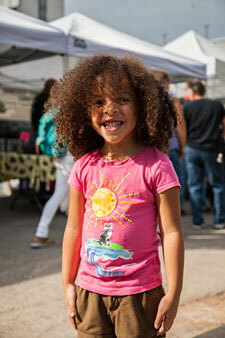 Love kids & local food? 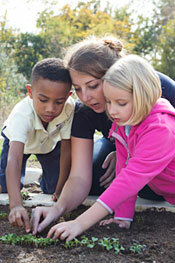 Sprouting Healthy Kids After School program needs new leaders. The SHK After School Leader will use SFC’s Sprouting Healthy Kids After School Activity Guide and will be assigned either one, two, or three schools, with clubs that meet either once or twice per week in the spring semester. Pay is $12/hour. Email resume, cover letter, and three references to Sari. No phone calls, please. Applications accepted until November 25, 2013. Position begins January 6 , 2013 Details here. The best holiday gifts are the ones you make yourself: take care of some of your holiday shopping in SFC's teaching kitchen! In our Holiday Gifts Cooking Class, we'll make homemade mustard, chai mix for tea, vanilla extract, preserved lemons, and chocolate bark, and you'll go home with a small batch of each in decorative jars and packages for gifting! Details and register here. 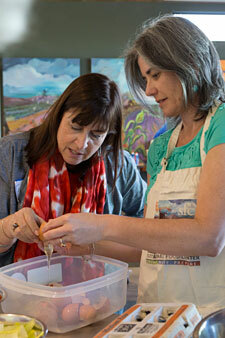 This year saw 642 active volunteers at Sustainable Food Center. That’s right. SIX HUNDRED AND FOURTY TWO volunteers donated their time to being in the office, at the SFC Farmers’ Markets, conducting nutritional demonstrations, and so much more. How do we recognize these amazing folks? We throw an appreciation party! This October was our 6th Annual Volunteer Appreciation. Over Black Star Co-op appetizers, beer, and wine, 200 volunteers mixed, mingled, and were showered with “thank yous.” This year’s photo booth was a hit and brought together volunteers from various activities and tasks. Make sure you check out the photos! 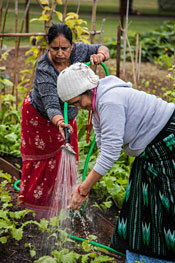 A community garden is a place for food, friends, flowers and community. Find out how to contribute to the economic, social, and environmental vitality of your neighborhood by starting a community garden. On Dec 7th, our Community Garden Leadership Training Class will cover: community organizing, how to secure land, garden organization structures, and fundraising & community outreach. There is a high interest in community gardening in Austin, and very limited spaces available at the current community gardens. 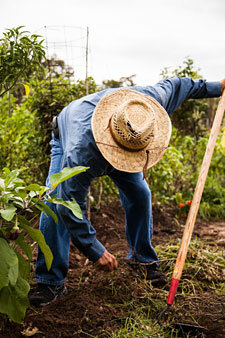 Come learn about how we can work together to start more gardens. Class is free, but registration is required here. Get recipes for local, seasonal food from your garden or SFC Farmers’ Markets in your inbox! Sign up for our Rise & Shine newsletter or check out our recipe blog—a new recipe is posted every week to keep you inspired in the kitchen. This week, we give thanks for our supporters, our volunteers, and our hardworking food community—together, we are building a healthy local food system where everyone has access to fresh, affordable, nutritious food. Because of your gifts of time, money, and heartfelt support, the future looks healthier for us all! SFC’s Executive Director is the new Chair of the Austin/Travis County Sustainable Food Policy Board. Click here to read what Ronda has to say about last week’s important city council meeting regarding the urban farm code. Get everything you need for Thanksgiving at SFC Farmers’ Markets—we’ve even made a shopping list for you! Our Thanksgiving Dinner lookbook is here. Kick off Eat Drink Local Week with An Evening with Will Allen at the Paramount Stateside Theater. Will Allen, son of a sharecropper, former professional basketball player, ex-corporate sales leader and now farmer, has become recognized as among the preeminent thinkers of our time on agriculture and food policy. The founder and CEO of Growing Power Inc., a farm and community food center in Milwaukee, Will is widely considered the leading authority in the expanding field of urban agriculture. After Will Allen’s talk, Texas Tribune’s Evan Smith will moderate a panel discussion around the issues of sustainable agriculture. Afterwards, stay and shop at Edible Austin’s Farmers Market in the lobby. STOP! A market right in the middle of Congress Ave? SFC Farmers’ Market is a featured part of the Dec 7th Holiday Sing-Along & Downtown Stroll! This annual FREE family-friendly event begins first with people passing through the market on Congress on their way to the caroling to grab a quick hot cocoa or hot kolache about 5 pm. Then, at 6 pm the community caroling begins at the Capitol grounds led by John Aielli, host of the KUT 90.5 show Eklektikos. When the caroling ends, the holiday tree in front of the Capitol is lit and participants stroll down Congress Ave where they find the street alive with music, art, shopping and more. Mark your calendars for Saturday, Dec 7th, and come stroll down Congress. Details here. Our Meetup group SFC Friends of Food is heading out to the “Foodopoly” Book Signing, Presentation, and Q&A with Food & Water Watch’s Wenonah Hunter on Tuesday, December 3rd. Get the details and RSVP here. And even if you can’t make this one, we’d love you to join our group!